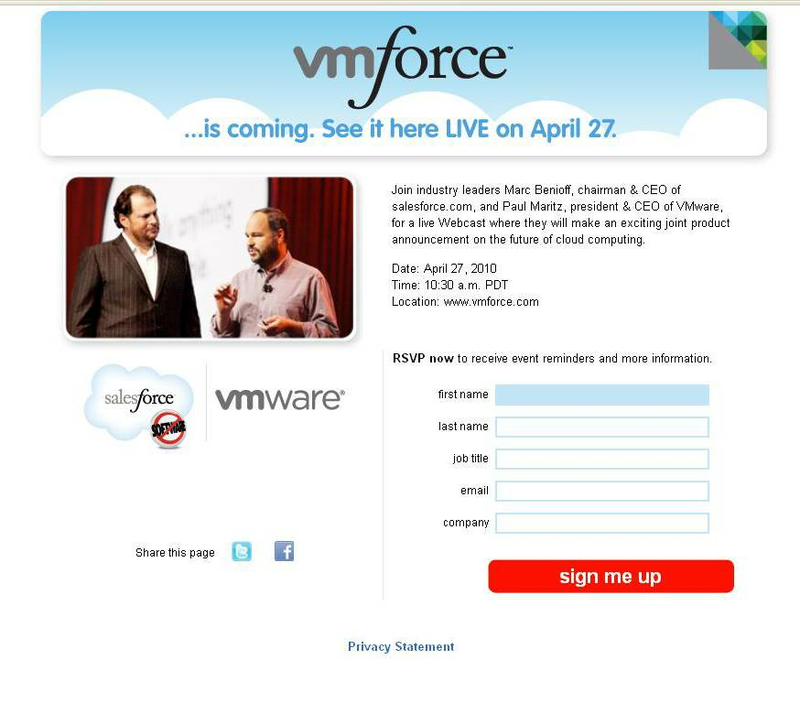 On April 27, VMware and Salesforce.com will reveal VMforce to the world. As anticipation builds, find out everything we know about VMforce in this special report. The VMforce news due from VMware and Salesforce.com has everyone in cloud computing and virtualization talking. 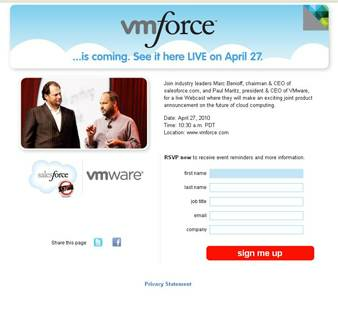 On April 27, VMware and Salesforce.com will announce details on VMforce. The companies say this new product will change the future of cloud computing, and as that date approaches, details are starting to trickle out about VMforce. Observers expect the VMforce news to focus on a new Platform as a Service (PaaS) offering aimed at Software as a Service (SaaS) and Web services developers. VMware, with its focus on virtualization and data center infrastructure, would run the service, which would tie into Salesforce.com's stable of service providers. VMware has been branching out of the virtualization market with its recent acquisitions of SpringSource, a development platform provider, and Zimbra, a hosted email vendor. (SpringSource even hints on its website that the VMforce news "will impact enterprise application development and deployment.") And Salesforce.com has expanded beyond its CRM SaaS beginnings to offer its Force.com development platform. VMforce is expected to significantly combine those efforts. This special report on the VMware and Salesforce.com VMforce news features complete coverage from TechTarget's family of sites focused on the cloud computing and virtualization markets. Check back for regular updates, and for the latest on VMforce, follow SearchCloudComputing.com (@TTintheCloud) and SearchServerVirtualization.com (@ServerVirt_TT) on Twitter. As the date of Marc Benioff and Paul Maritz's live webcast draws closer, certain pieces of the puzzle have fallen into place and hints as to what VMforce may actually be are emerging. Our initial news brief on VMforce indicated that VMware and Salesforce.com could be working on anything from a new class of application to an Infrastructure as a Service (IaaS) offering similar to Amazon Web Services or even an overhyped combination of Salesforce applications running on vSphere. This podcast with virtualization expert Rick Vanover discusses the potential of VMforce, along with what the two organizations are actually cooking up behind the scenes. For more on VMware, Salesforce.com and VMforce, be sure to check out our news page for the latest on cloud computing.